I really don't want to die, it's just that I'm pretty sure I'm dying. 1. Getting a second opinion means checking WebMD AND the Mayo Clinic. 2. You've correctly self-diagnosed yourself at least once…and that makes the paranoia even worse. What if I'm right AGAIN?! 3. You take chest pain very seriously, which is why you always think you are having a heart attack. It's taken all the fun out of bacon. 4. When you get a little sick, you lie awake thinking it's something worse, and then you get sicker. 5. The Mayo Clinic Symptom Checker has completely ruined your mental health. Costochondritis? Did I get that from Costco?! 6. Your friends and family routinely ban you from googling your symptoms. 7. Headache...or tumor? Cyst...or tumor? Birthmark...or tumor? Cheerio that fell down your shirt...or tumor? See also: Zit or cold sore? 8. 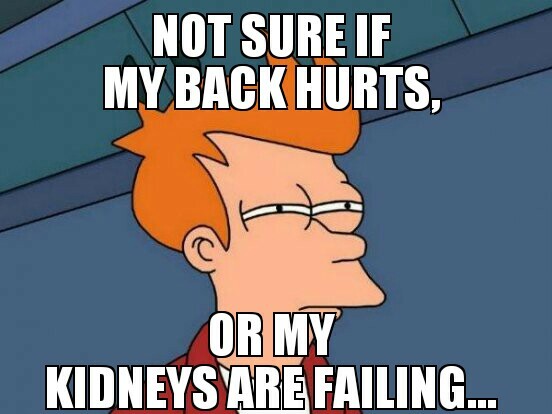 You don't get backaches, you get kidney problems. But if I drink any more water, my electrolytes might get out of balance, DEAR GOD. 9. Poop issues are the worst, because they're scary AND you can't tell anyone about them. 10. If your head is feeling a little warm, then you're taking your temperature at least three times. The first one didn't count, you had water beforehand. 11. For the ladies, constantly worrying that you are pregnant even if this is embarrassingly unlikely. 12. When your doctor asks about your symptoms, they're all direct quotes from WebMD. You're just trying to be helpful. 13. Sometimes you wish your appendix would just burst and get it over with, already. 14. Bug bites become terrifying little enigmas to you. Is it fleas?? Shingles?? Hives?? Warts?? West Nile?? People get West Nile all the time. 15. Any tiny symptom that lasts for longer than a week is no longer a tiny symptom. 16. Whenever your throat feels scratchy, you immediately blame the last co-worker of yours who coughed. Stop infecting my life, Kevin. 17. You frequently wish there was a way to google skin rashes without actually having to look at any. 18. You're constantly worried that your doctor might be having an off day when you visit. What if they're tired? Distracted? 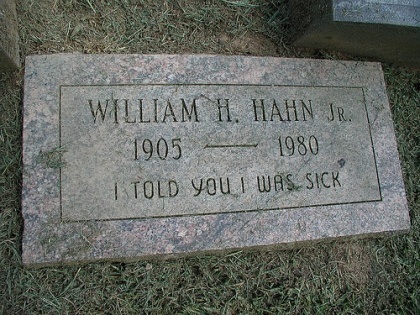 SICK? 19. You've learned by now which friends take you seriously and which friends don't. 20. You sometimes feel completely overwhelmed by all the degenerative illnesses that run in your family. 21. In college, getting a roommate who was pre-med was like hitting the jackpot. 22. Crooked smile? Nerve damage. 23. You’re relieved when you receive antibiotics. BUT WHAT IF YOU’RE ALLERGIC TO THE ANTIBIOTICS? 24. Leaving the house without Purell makes you feel naked. 25. You know exactly how much it costs to go to the emergency room. The intake nurses know which arm you like your bracelet on. 26. You're constantly needin' that D.
You're wondering if the limits on the box regarding the allowable daily intake of the D are flexible. 27. You know exactly which diseases dogs can give to humans. 28. You suspect that sometimes your doctor is giving you a prescription just to make you go away. 29. Any hangover that lasts longer than a day is obviously mono or the flu. 30. If you don't get better after antibiotics, it's because your infection has now mutated into a super bacteria, which will end the world.